Firstly I would like to apologise on behalf of your doctors that we are all human we mess up. I am sorry as some ( though very few) doctors came to work late hence the clinics were running 30 mins behind. Sometimes as doctors we get distracted by some unessential, not patient related, things. Having admitted our mistakes that would have caused the clinic to run late, I must now address the most crucial issue that we must not overlook. The majority of doctors arrived in time and some came an hour before the clinics started. Regardless of these doctors arriving early the clinics still ran late and patients were inconvenienced. We owe patients an explanation but we can not fully give them the details on the day of their appointment. If we did on the day of the appointment then the clinic would run late by an additional hour. This would annoy a lot of patients. I am one the culprits as some of my patients end up waiting longer that I would like if I were a patient. Oh yes I have been a patient and I hate waiting . In rare occasions I may arrive late for my clinic but in most cases I am on time but still end up running 20 to 30mins late . Before giving some of the reasons beyond my control let me give a general breakdown of how I use my time in general. Patients sometimes wonder why l may not call them when I do not have a patient with me. At times I may be reading their notes before I call them or reviewing the results of tests or referring other patients to the specialist. Reviewing patient’s notes and investigations just before seeing them allows the doctor to be prepared for upcoming consultation. Another thing that is forgotten is that after each consultation a doctors need to do “housekeeping ” to make sure that they are ready for the next patient. A doctor must make sure that effects of the previous consultation do not affect the coming consultations. It is better for a doctor to pause and even have a cup of tea so as to prepare well for the next appointment. Occasionally patients may wait whilst the medics take a break. This may feel unfair to the patient but doctors work very long shifts and would struggle to function effectively if they were not allowed to take a break. Doctors do a lot and try to be as quick as possible without forgetting safety or being at risk of making mistakes. If you were waiting in the Accident and Emergency department the likelihood is that the medics would be dealing with other patients who may have a more pressing need than your own. Sometimes this will be patients who are clinically unwell but equally, it can be dealing with a patient who is in pain or distressed. –screaming children who will need special skills to calm them down so that l can properly assess them. – Elderly patients who can hardly walk or get up and down the couch for examination. – Patients who have mental health issues like stress , anxiety and depression will need more time. It can be worse if they are suicidal and it’s not safe to let them go home. – When breaking bad news to a patient , a doctor needs more time . Life changing or threatening diagnoses need to be fully explained without hurrying the patient but this will make the doctor run late if not well planned. Patients will need time to adjust, to ask questions, and maybe even to cry. – Patients who are hard of hearing will require more time . – Patients who do not speak the same language as the doctor’s. They will need an interpreter to be either present in person or via phone. This will require more time to arrange and then use the service. – Some patients talk very slowly and there is nothing a doctor can do to hurry them. – Some patients may bring family members and friends who will also want to ask questions. – Some patients have complicated medical history that may take time to understand . – Some patients may need urgent referral to the hospital or urgent medical intervention. It takes time to get a patient accepted at the hospital by the specialists. Some patients may require urgent nebulisation ( treatment for asthma) due to flare up of their asthma. – Sadly as doctors we know time management but we are not exactly in a position where we could just rush things and hope for the best. You must remember that if we mess up, people could die. – The problem is that in some cases doctors do not know which patient is going to needing more time. We sometime make some educated guesses but we do have patients that turn up needing to be seen urgently. We try our best to fit them in because of the seriousness of their medical condition . And if you happen to be following one of these patients, then you are out of luck. – I will not forget to mention some of the unexpected things that can happen to mess up the clinic schedule that we cannot do much about: an emergency case shows up , that no-show patient comes in 30 minutes late but insists , in tears that he must be seen. As a doctor I cannot turn that patient away so the delay keeps getting worse and worse. There are things doctors can do to mitigate the wait for patients who follow. For example, the doctor arriving on time and also booking double appointments for patients who are likely to require more time. 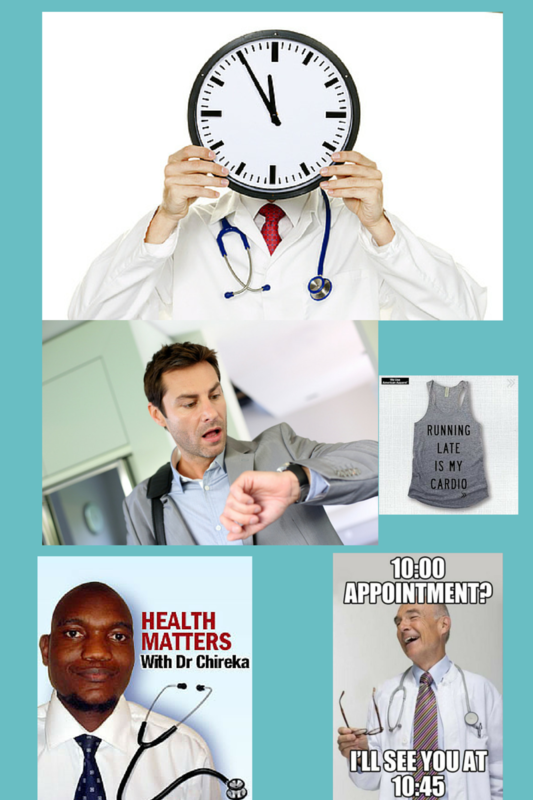 Even with these measures a doctor can still run late. Other things can be done of course, while not directly addressing the wait, many doctor’s offices have TV monitors sometimes with educational programs, WiFi availability… and hopefully some decent magazines to make the wait bearable! Patients have to do their part by arriving in time for their appointments. We cannot ask why our doctor is running late when we are also turning up late for our appointments. From my own experience if a particular patient is angry because of a long wait , after apologising , I reassure them that I will spend as much time as needed with them. Interestingly many of these patients end up taking much longer than expected making me run more and more behind. Bottom line: in many situations, good healthcare can’t be rushed. I urge you to allow a bit of extra time when you visit your doctor or hospital for treatment. Please feel free to send me your comments or observations. I would love to hear from you. Previous PostHealth effects of smoking tobaccoNext PostDoes Sadza cause diabetes ?